Thank you for visiting this website. 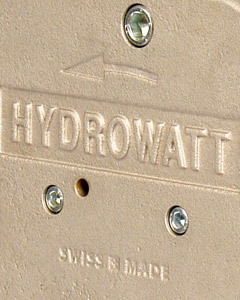 HYDROWATT AG endeavours to keep the website up-to-date. However, HYDROWATT AG gives no warranties of any kind that the material on this website will be complete, accurate, reliable and timely. HYDROWATT AG disclaims all warranties, guaranties or representations, including the warranties of fitness for a particular purpose. HYDROWATT AG is not responsible or liable for the contents of any linked website. HYDROWATT AG is not responsible or liable whatsoever for any loss suffered caused by viruses or other reasons that may infect your computer equipment or other property by reason of your use of, access to or downloading of any material from this website or any linked website. All copyright © and other intellectual property rights in all text, images and other materials on this website are the property of HYDROWATT AG. The content of this website may not be reproduced, distributed, displayed, posted or used in any way without the prior written consent of HYDROWATT AG.